Around The Jazz Internet: Aug. 31, 2012 : A Blog Supreme Drummer Jimmy Cobb questioned, a poetic Jazz Passenger and goodbye to bassist Charles Flores. 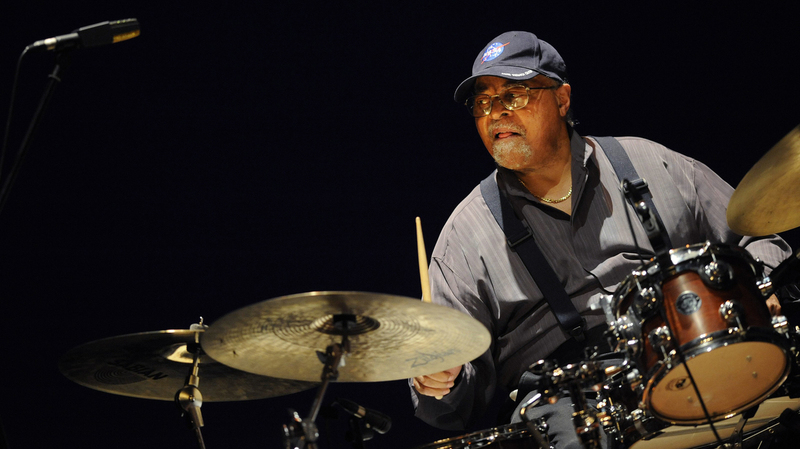 Drummer Jimmy Cobb plays at the 2012 Heineken Jazzaldia, the international jazz festival in San Sebastian, Spain. Larry Blumenfeld, a very good writer, has a new jazz blog up at the ARTINFO.com site. Q&A with Jimmy Cobb, the great drummer. He is the last living person to play on Kind of Blue and talks about that period a little. Also, somebody make it happen between him and Buck Hill, please. RIP Charles Flores. The bassist died last week but news just came out last weekend. He won a Grammy Award with Michel Camilo's trio, a group we recorded in 2009. Roy Nathanson, Jazz Passengers saxophonist and poet, is the subject of an Independent Ear interview. Also, the female jazz writers series continues with Angelika Beener. Josh Berman, Chicago cornetist, is profiled. Though known as a very modern musician, his new album draws on a lot of study of '20s and '30s recordings. Saxophonist Rahsaan Barber is the subject of a story in a Nashville publication. Lots of Nashville links in this column lately. Six easy ways for jazz musicians to expand their audience, from saxophonist Steve Lehman. I thought these were some astute observations about how to orient jazz music for the marketplace, with the subtext that not every jazz musician is interested in doing so. A few links between jazz and electronic dance music, featuring Robert Glasper and DJ Quantic. An interview with Yoshie Akiba, the woman behind the Bay Area Japanese restaurant(s) and jazz institution Yoshi's. JazzWeek, the radio chart service, handed out a number of awards recently. The big one went to WGBH's Eric Jackson. The Detroit Jazz Festival's great benefactor ($15 million and counting), the heiress and businesswoman Gretchen Valade, is interviewed. Here's an older article on her too. You may also know that she started Mack Avenue Records, the label which has signed Kenny Garrett, Christian McBride, Danilo Perez, Gary Burton, etc. Also, this will happen in Detroit. "Coltrane Rules, Critics Drool." Funny headline, but it's actually about an interesting museum exhibit about how John Coltrane was portrayed by the press in the mercurial 1961-1966 period. Check out this neighborhood in Amsterdam, featuring streets named after Charlie Parker, Ben Webster, Billie Holiday and more. AllAboutJazz features pianist Mike LeDonne and guitarist Miles Okazaki this week. The Jazz Session spoke with saxophonist Evan Cobb and pianist Donald Brown, both of Tennessee. Violinist Ben Powell is winning comparisons to Stephane Grappelli. Renaud Garcia-Fons: Tiny Desk Concert. JazzSet features Regina Carter and Wynton Marsalis from Newport 2011. Marian McPartland's Piano Jazz features Melissa Walker. Cole Porter scored the relationship of one listener's parents, who were an interracial couple. A Blog Supreme is an ongoing conversation about jazz for both indoctrinated fans and curious listeners. Want to know more? Read our introduction to the blog. Want to get in touch with with host Patrick Jarenwattananon and the team? Send us an email.